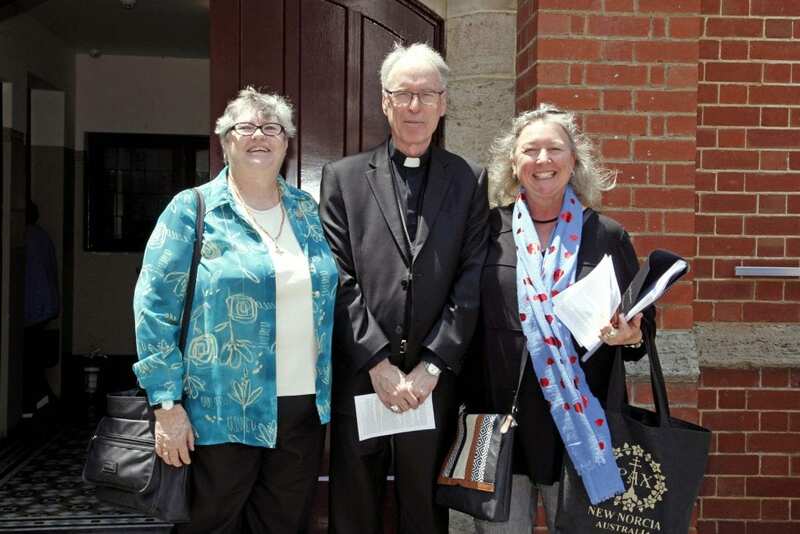 Auxiliary Bishop Donald Sproxton with Sr Margaret Scharf (left) and JEDO Director Carol Mitchell (right). Photo: Desire Mallet. The 2018 Peace Conference was held on the weekend of 10 and 11 November at St George’s Anglican Cathedral to acknowledge the centenary end of World War I. Justice, Ecology and Development Office (JEDO), an archdiocesan agency, as well as other members of the Social Justice commission, sponsored the event. The two-day conference aim to explore and promote peace “in the context of international, national and community settings”. A commemoration service was held on the morning of 11 November to acknowledge Remembrance Day, which was attended by Auxiliary Bishop Donald Sproxton, Sr Margaret Scharf OP, and JEDO Director Carol Mitchell. Speaking to The eRecord, Sr Margaret said it was essential for the Catholic Church to respond to the invitation to attend and engage in the conversation as the Conference promoted matters critical to the teachings of Jesus Christ. “The Church has been involved in matters of justice and peace in conscious and powerful ways for over 100 years and as the threat of global disruption through war and violence has increased in the new Millennium, rather than decreased, the more we need to pray, reflect and work together for creating practical means to achieving global peace,” she elaborated. “The Church has always been concerned with the ‘state of the heart’, the fact that we are in a relationship with God, self, and the others, including all creation. “We have the example of Jesus who constantly witnessed to the love, mercy and forgiveness of God, and the primary focus of care for the poor and marginalised; this is what needs to be shared in the public arena,” she continued. The speakers on the “Interfaith Panel on Peace” on Sunday 11 November. Photo: Desire Mallet. Sr Margaret was one of the panelists for “Interfaith Panel on Peace”, following the morning proceedings, where panellists shared the foundational teachings and beliefs of their particular religions. “Each religion teaches peace, each religion supports the growth of peace in the hearts of the believers,” Sr Margaret added. Sr Margaret emphasised that to achieve world peace is a “life-long struggle because the desire for peace has to dwell in the hearts of all people”. Commemorative Service for the centenary end of the First World War on Sunday 11 November at St George’s Cathedral. Photo: Desire Mallet. Reported by Vatican News on Sunday 11 November, Pope Francis drew attention on the centenary end of the First World War and referred to his predecessor Pope Benedict XV calling the war as “useless slaughter”. Proposing St Martin of Tours as a symbol of investing in peace, the Holy Father also said that the War was a “strong warning” to renounce the “culture of war” and end conflicts that are still shed blood in many parts of the world. “He cut his cloak in two to share it with a poor man. May this gesture of human solidarity indicate to everyone the way towards constructing peace,” Pope Francis said. Carol Mitchell remarked that “there was wonderful energy at the Peace Conference”. “It was great to be amongst those who have a similar vision for a just and peaceful future in our world – that is, talking about and working towards peace-making, building and sustaining on an international and national scale; and within our communities and homes,” Mrs Mitchell said.